LG's only sold two netbooks since entering the market in 2008—that's two models, not two units, though I wouldn't be surprised if the sales figures aren't too far off, considering they were pretty average. Enter the X20. Leaked via an FCC outing, the LG X20 has an Intel Atom N450 Pine Trail processor (joining HP's Mini 210, Toshiba's NB300 and NB305, MSI's Wind U130 and U135, and Acer's 532h ) and runs on Windows 7. 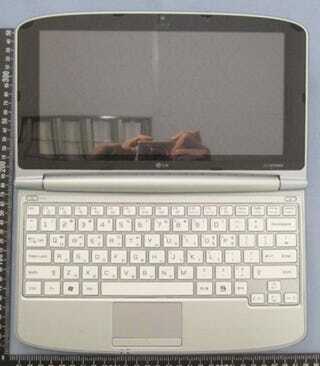 It may look small due to the pics, but the screen measures 10.1-inches supposedly, with the LCD a 1366 x 768 pixels job. Up to 2GB of RAM and a 250GB HDD, the listing claims there's also an Intel 3150 GMA graphics card, Bluetooth, Wi-Fi, and 1.3-megapixel webcam—plus HSPA 3G-compatible. Due to its very-much-unconfirmed nature, there's no further info or photos of the X20, but apparently it'll come in five variations of the model name—in the US, it'll be the X20, but in Canada, Europe, Australia and Asian countries it'll have either the X200, XB200, XD200 or XV200 model name. Tricksy.